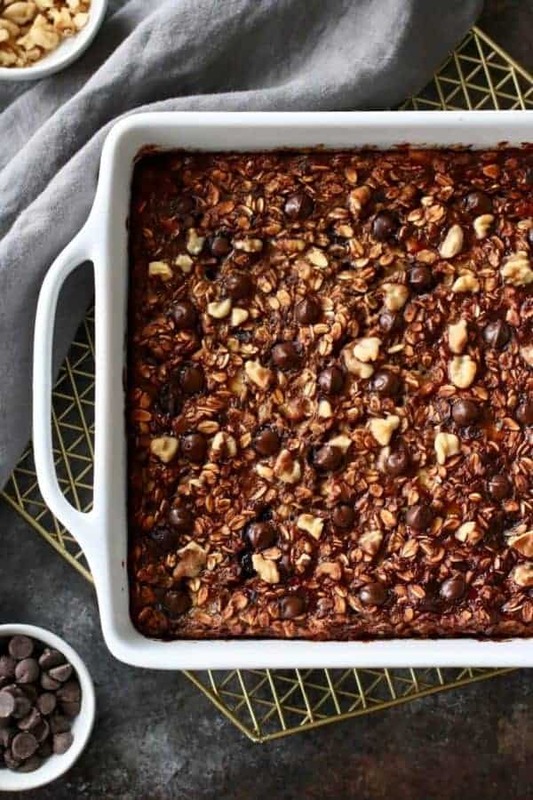 This quick-and-easy Banana Chocolate Chip Baked Oatmeal is perfect for a cozy breakfast or healthy snack throughout the week. 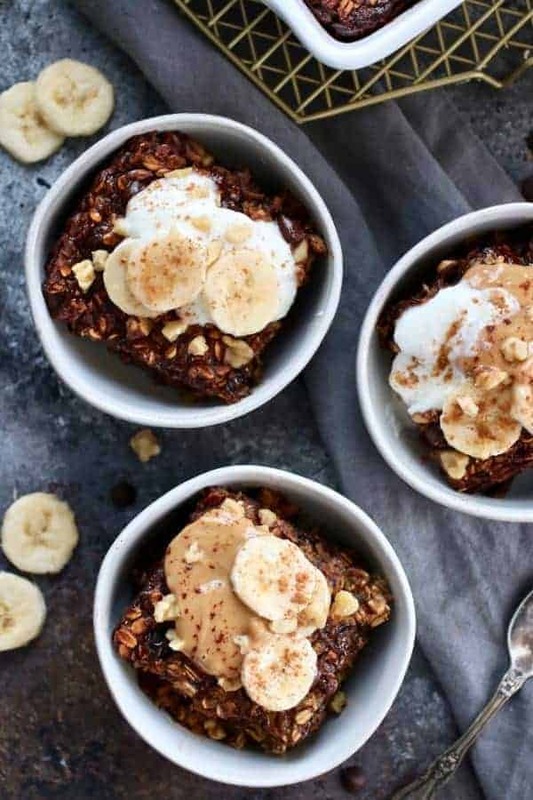 Put those overly ripe bananas to good use and give this Banana Chocolate Chip Baked Oatmeal a try. It’s made with real food ingredients and no added sweeteners. When buying bananas, I like to grab an extra bunch to allow for over-ripening of some of them resulting in the opportunity to make my favorite banana baked goodies. I always get a wee bit excited when the bananas start to turn brown. 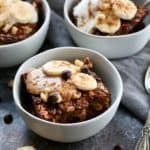 This Banana Chocolate Chip Baked Oatmeal is one of those recipes I like to make and like many of our recipes is not only simple but totally versatile. You can change up the ingredients with what you have on hand. For example, no walnuts? Try chopped pecans or omit altogether. No chocolate chips? Add blueberries or raisins instead. Really the only ingredients you need for the base of this recipe are oats, milk, overripe bananas and an egg (or egg sub). Beyond that, you can truly make this recipe your own with what you have on hand. Additionally, there are no added sweeteners other than the sugar that’s in the chocolate chips. The overripe bananas provide plenty of sweetness so no additional sweeteners are needed. Woot! For a 100% refined sugar-free oatmeal bake, omit the chocolate chips and add a couple of handfuls of blueberries instead. Those with an egg-allergy or sensitivity can substitute a flax egg (see recipe below). 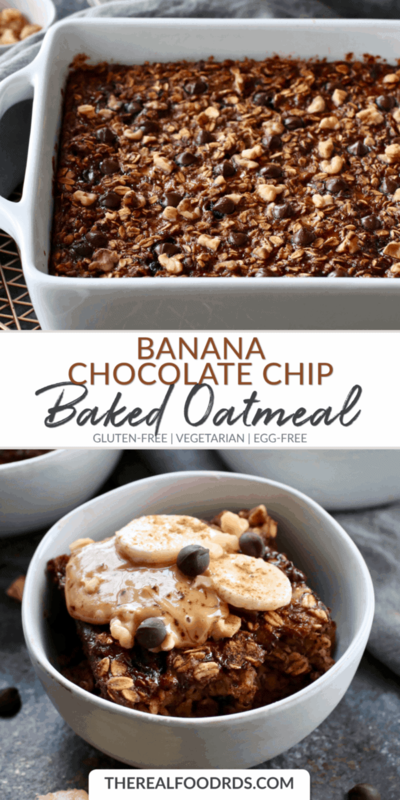 Add Banana Chocolate Chip Baked Oatmeal to your weekend meal prep menu and enjoy it throughout the week warm or cold. I love a good ‘ol classic bowl of oatmeal, but the convenience of having it already made and ready for eating, is quite nice. Therefore, I think baked oatmeal would have to be my choice if I had to choose. This recipe is perfect for including in a weekend meal prep to enjoy throughout the week. My hubby enjoys it cold in the morning with a glass of Organic Valley Grassmilk for breakfast (usually standing over the sink to allow the crumbs to strategically fall into it…don’t ask!) and I prefer it reheated as an afternoon snack with dollop of Organic Valley Grassmilk Yogurt, a tablespoon of natural peanut butter, a few chopped walnuts and a sprinkle of cinnamon. You can’t beat the combo of banana, chocolate and peanut butter…right?! I think they call that a funky monkey. So I guess when topped with peanut butter you can call this recipe Funky Monkey Baked Oatmeal! I like it. Chocolate for breakfast, say what? I added just 1/4 cup of chocolate chips to give this recipe that chocolatey burst of flavor and also as requested by my hubby. However, if chocolate for breakfast is not your thing (like it is my husband’s), you can also add a handful of blueberries (fresh or frozen) or really any fruit of your choice. As stated above this recipe is very versatile. Made with Organic Valley Grassmilk Milk. As you may know, Organic Valley is our go-to when it comes to dairy. This recipe features Organic Valley Grassmilk Milk, Organic Valley Eggs and Organic Valley Grassmilk Yogurt for topping. Choosing good quality dairy is important to us to ensure that we’re consuming the option that’s best for our health, the cows and the environment. We’re especially enjoying their line of Grassmilk products. These products are made with dairy from 100% grass-fed cows. To learn more about grass-fed dairy, I highly recommend you check out this article called 8 Things You Should Know About Grass-Fed Dairy. Jess and I also had the opportunity to shed some light on this topic by being guests on the Rootstock blog and sharing our Advice from a Dietitian: Why You Should Choose Organic and Grass-fed Dairy. You can get$1.00 off any Grassmilk product with this coupon. Oh, the toppings! So many options. 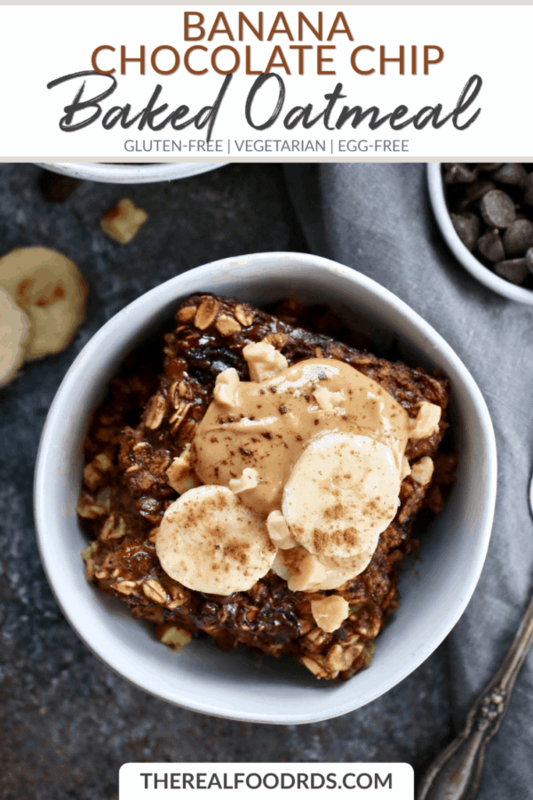 The options are really quite endless when it comes to topping this delicious and cozy Banana Chocolate Chip Baked Oatmeal. Here are a few ideas: sliced bananas, fresh berries, raisins, chocolate chips, cacao nibs, chopped nuts, chia or hemp seed, pumpkin seeds, drizzle of organic honey or maple syrup, dollop of yogurt, dollop of peanut butter or nut butter of choice, cinnamon or nutmeg, milk, and the list goes on. 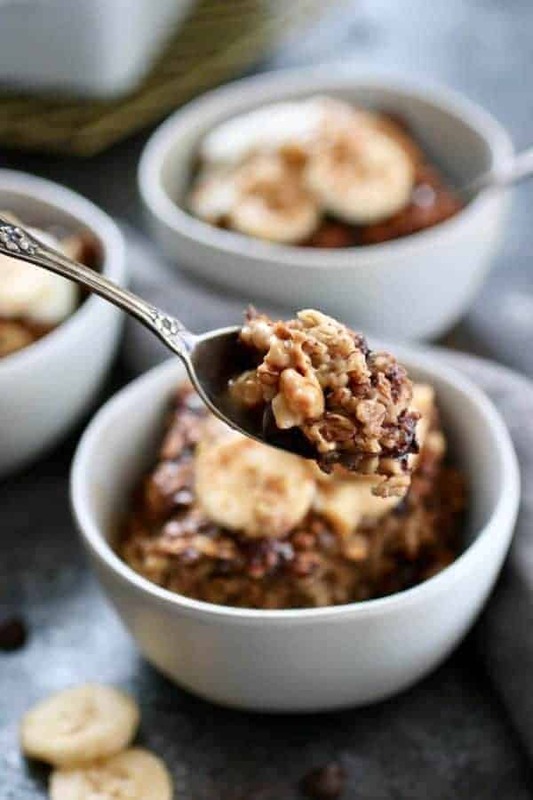 It’s time for you to enjoy a bowl of this cozy, warm Banana Chocolate Chip Baked Oatmeal?! It’s just a few ingredients and a little bit of time in the kitchen away! Pre-heat oven to 375ºF. Grease a 9×9 baking dish and set aside. In a bowl combine all of the ingredients. Stir until well combined. Transfer batter to baking dish. Top with a few extra walnuts and chocolate chips. Bake in the oven for 35-40 minutes or until center is cooked through. Serve topped with organic natural peanut butter, banana slices, chopped walnuts, cinnamon and/or Organic Valley Grassmilk Yogurt.